Dr. Uma Nallathambi Completes Masters Degree In Clinical Dentistry. The Brighton Implant Clinic is proud to announce another achievement with Dr. Uma Nallathambi, receiving her MClinDent Masters Degree from Kings College, London. The degree was a part-time post-graduate certification in fixed and removable prosthodontics, completed over a period of 4 years. Dr. Nallathambi has a rich and varied resume, and is well-known and liked by patients for her chair side manner. The comfort of her patients is of such importance to Dr. Nallathambi that she undertook a special sedation course to help anxious patients feel more comfortable during treatments. As part of her masters degree, Dr. Nallathambi did her dissertation on complications specifically related to ‘Teeth-on-4’ dental implant bridges. Dr. Nallathambi graduated in India in 2000, obtaining her GDC registration in 2009. She is highly experienced in restoring both simple single tooth implant as well as complex full arch cases using the Teeth-on-4 concept. Founder and Clinical Director of the Brighton Implant Clinic, Dr. Bruno Silva, said Dr. Nallathambi is a great representative for the clinic as it continues to push for innovation and excellence. “We are committed to offering our clients access to the most cutting-edge technologies and treatments, at affordable prices – and are constantly seeking out new methods and techniques. “Our dentists are handpicked individuals who are passionate about perfecting their patient’s smiles. They are proactive about training and furthering their education in order to be the very best,” he also added that Dr Nallathambi has been an integral part of the team at the Brighton Implant Clinic since 2010. 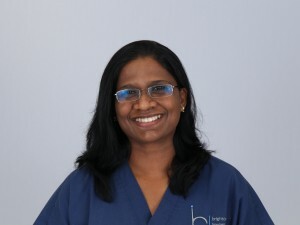 Dr Uma Nallathambi carries out dental implant treatments, both surgical and prosthetic stages at Brighton Implant Clinic (Brighton Branch, Southall Avenue). If you wish to see Dr Nallathambi for an implant consultation please contact our reception team to arrange an appointment.